The music was played on the successor to Manchester's "Baby"
A scratchy recording of Baa Baa Black Sheep and a truncated version of In the Mood are thought to be the oldest known recordings of computer generated music. The songs were captured by the BBC in the Autumn of 1951 during a visit to the University of Manchester. The recording has been unveiled as part of the 60th Anniversary of "Baby", the forerunner of all modern computers. The tunes were played on a Ferranti Mark 1 computer, a commercial version of the Baby Machine. "I think it's historically significant," Paul Doornbusch, a computer music composer and historian at the New Zealand School of Music, told BBC News. "As far as I know it's the earliest recording of a computer playing music in the world, probably by quite a wide margin." The previous oldest known recordings were made on an IBM mainframe computer at Bell Labs in the US in 1957, he said. "That's where the whole computer music thing started but they were not the first to have a computer play music," said Mr Doornbusch. That honour goes to a third machine called CSIRAC, Australia's first digital computer, which "stunned" audiences with a rendition of Colonel Bogey. "It played music months or weeks before [the Manchester] recording," said Mr Doornbusch. However, no one has yet unearthed a recording of CSIRAC in action. Documentary evidence of the Manchester machine's musical abilities exists thanks to a BBC outside broadcasting team who had gone to the University to record an edition of Children's Hour. At the time Manchester was home to a Ferranti Mark 1, the first commercially available general purpose computer. "Word must have got around that this electronic brain could play music," explained Chris Burton of the Computer Conservation Society (CCS). The music program was written by a friend of computing legend Alan Turing called Christopher Strachey, a maths master at Harrow. "My understanding is that Chris Strachey got on and wrote a program for playing draughts and when the program terminated it played God Save the King," said Mr Burton. Others contend that the program was purely for playing music. Either way, following the recording, a university engineer called Frank Cooper asked if he could have a copy. Unable to give him the original, the BBC team cut him another version. "At the time of the recording outside broadcasts were recorded on to acetate disks," explained Mr Burton. "You can hear the presenter tell the recording engineer in the van 'lift Jim' and that meant lift the cutter off to stop recording." During the session, the temperamental machine managed to work its way through Baa Baa Black Sheep, God Save the King and part of In the Mood. Following one aborted attempt, a laughing presenter says: "The machine's obviously not in the mood." The disc was eventually passed to the CCS, who, along with the University of Manchester, has released the recording to mark the 60th anniversary of the Ferranti machine's forerunner. 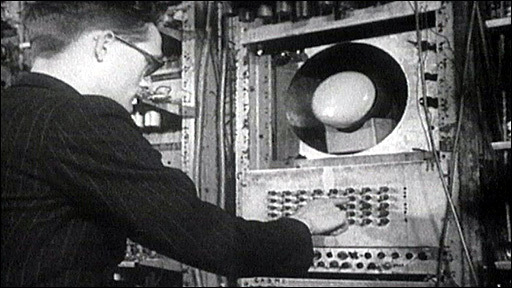 In the late 1940s Manchester was a hotbed of computer innovation following the birth of Baby, or Small Scale Experimental Machine, in 1948. Baby was the forerunner of the Ferranti Mark 1 and was the first computer to contain a memory device that could store a program. "Baby was the first universal computer," explained Mr Burton. "It would perform any task - within its capacity - depending on what program was put in." The memory was built from a Cathode Ray Tube and allowed scientists to program 1024 bits, compared to the billions in today's modern computers. Before Baby was built, computers such as ENIAC and Colossus had to be rewired to perform different tasks, said Mr Burton. "You couldn't easily change what they did," said Mr Burton. 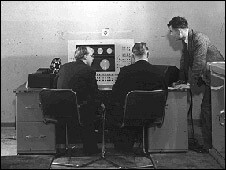 Baby successfully ran its first program - to determine the highest factor of a number - on 21 June 1948. "That particular program was devised solely to make the machine work very hard so we could see where it was about to go wrong," Geoff Tootill, one of the builders of Baby told BBC News. "If you gave the problem to a mathematician, he would take a fraction of a second to give you an answer." However, companies quickly capitalised on Baby's unique abilities, giving rise to machines like the Mark 1. "It was the start of the computer age," said Mr Tootill. "Although we didn't know it was going to be epoch-making or earth-shattering other than for weather forecasting and other scientific disciplines."